South Korea is not just the hub of global electronics industry, it's more than that. South Korea produces most advanced semiconductor ICs, systems and other components for global electronics industry in a big way. Due to recent rise of tensions in North Korea and South Korea, Industry experts such as IHS has started rising concern, so that the electronics industry can be prepared rather than taken by surprise. If the tension between the two Korean nations flare up into war, the impact on the market can be worse than Japan's Tsunami in year 2011. To save the world economy from a such a man-made disaster all the responsible people should work to cool the tensions. What would happen if half of all global production for dynamic random access memory (DRAM), two-thirds of NAND flash manufacturing and 70 percent of the world’s tablet display supply suddenly disappeared from the market? The answer would be chaos, with the worldwide electronics supply chain grinding to a halt and stopping major market product segments in their tracks, including smartphones, media tablets and PCs. For high-tech companies, this could be the outcome if current tensions escalate to the point of war on the Korean peninsula, resulting in the disruption of South Korea’s technology manufacturing base. While IHS regards such a major conflagration and disruption as unlikely, forward-thinking technology firms are planning for such a contingency, just as they are preparing for other natural and man-made disasters that could impact their businesses in the future. “However, South Korea now plays a more important role than ever in the global electronics business. And with the supply chain having become more entwined and connected, a significant disruption in any region will impact the entire world. Because of this, it is important for companies to understand the magnitude of South Korea’s role in the global electronics market—and to prepare for any contingencies,” said Mike Howard, senior principal analyst for DRAM & memory at IHS. Leading technology firms Samsung and SK Hynix are headquartered close to Seoul, the capital of South Korea, which lies only about 30 miles from the border with North Korea. Both companies have major manufacturing operations in the area as well. “Any type of manufacturing disruption of six months would prevent the shipment of hundreds of millions of mobile phones and tens of millions of PCs and media tablets,” Howard warned. 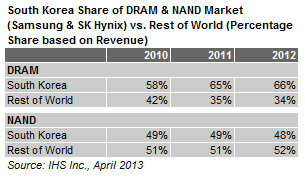 Fully 66 percent of industry revenue for the dynamic random access memory (DRAM) market, as well as 48 percent of total NAND flash revenue, belonged in 2012 to the two South Korean memory titans Samsung and SK Hynix. While their combined share of both in the NAND market has remained fairly level for the last three years, the collective portion in DRAM of the two entities has been steadily rising. Such a high proportion of global production could not be easily or quickly replaced by manufacturers in other regions. The Icheon facility of SK Hynix is located approximately 30 miles southwest of Seoul, while Samsung’s massive manufacturing complex at Hwaseong is within 24 miles of the capital. DRAM plays an essential role in products including PCs, media tablets and smartphones. While some gadgets could have their amount of memory reduced—a smartphone with 32 gigabytes (GB) of NAND could be downsized to 8GB, or an 8GB laptop reduced to 4GB—other devices must have the memory for which they were originally designed, especially where DRAM is involved. “A server with only half its intended DRAM is essentially half a server—and a smartphone cannot have its DRAM quantity changed, as it needs the original amount for which it was designed,” Howard noted. An equally bad situation could occur in the large-sized display market, which is heavily dependent on South Korean suppliers, especially in the media tablet market. LG Display and Samsung Display of South Korea together held a 49.6 percent share of unit shipments of large-sized liquid crystal display (LCD) panels in the fourth quarter of 2012. Large-sized panels are defined as those that are 10-inches or larger in the diagonal dimension and are used in products including televisions, notebook PCs and desktop monitors. Also included in the category are and 7-inch and larger displays used in media tablets. 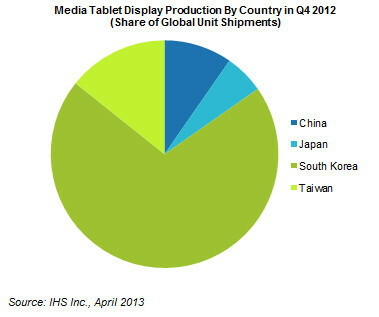 South Korea accounts for 70 percent of global supply of tablet display unit shipments. Samsung at present is the global leader in smartphones as well as in total handsets, while fellow South Korean manufacturer LG Electronics ranks No. 6 in both categories. Together, the two companies account for more than a 30 percent market share for cellphones and smartphones.